In partnership with Cowfeather Press to produce an anthology to benefit the Madison Poet Laureate Fund, poems for the anthology that referenced locations in downtown Madison were also selected by Madison B-Cycle, and produced on decals affixed to 30 of the fleet's bicycles. The theme was "Luck of the Draw" and poems touched, in some way, on good fortune, misfortune, opportunities gone awry, flukes, coincidence and second chances. They were packed into jawbreaker capsules with jawbreakers and other candies, and made available - along with the possibility of winning a year's subscription to Verse Wisconsin - from a dispenser coined the Verse-O-Matic. 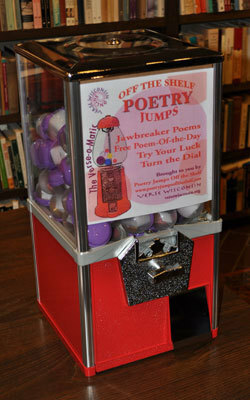 This dispenser was transported to various Wisconsin venues statewide, and traveled with the Verse Wisconsin editors to events, conferences and festivals throughout 2011. The poems were also published in the summer 2011 online issue of Verse Wisconsin. Some of the venues where the Verse-O-Matic took up residence were Boswell Books in Milwaukee; the Lussier Education Community Center, Avol's Bookstore and Orange Tree Imports in Madison; Windhover Center for the Arts in Fond du Lac; Nita Moore's healthful living facility in Iron Ridge; and the Harmony Cafe as well as Lawrence University in Appleton. August and September 2012: The Allium Restaurant & Bar in Milwaukee. The theme was "Lines in the Sand" reaching across territorial, cultural and interpersonal boundaries and paired with the artwork of Sarah Spencer, then produced as postcards. 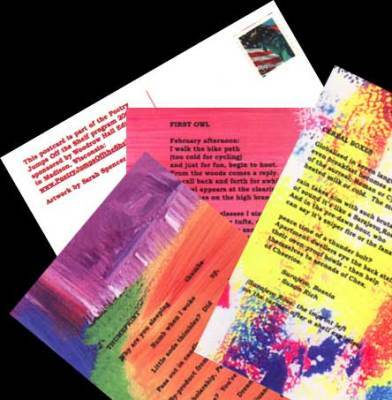 These were made available to the public at the first Lorine Niedecker Poetry Festival in Fort Atkinson, the Harambee-South Madison Health & Family Center and the following places: Willy Street Co-op, Regent Market Co-op, Wil-Mar Neighborhood Center, Goodman Community Center, the Alicia Ashman Branch Library, Monroe Street Branch Library, Southside Branch Library, Madison Central Library, Avol's Bookstore, EVP Coffee, the Edgewood College campus and the Creative Writing Department at the University of Wisconsin in Madison, Wisconsin; Scott's Pastry Shoppe in Middleton, Wisconsin; The Wired Cyber Cafe in Taos, New Mexico; the Sedona Public Library in Sedona, Arizona; the Creative Writing Department at the University of Wisconsin in Whitewater, Wisconsin; InnerGate Therapeutics in Evanston, Illinois; the Seattle Public Library and the Frye Art Museum in Seattle, Washington; the Get Lit! Spokane Literature Festival in Spokane, Washington; the Skagit Poetry Festival in La Conner, Washington; Centrum Writers Conference in Port Townsend, Washington; The Bistro on the Penn State Campus and at the Martin Library in York, Pennsylvania; and at Carmichael's Books in Louisville, Kentucky. "No Direct Route Home" involved surprising detours paired with the artwork of Sarah Spencer produced as postcards and as part of the National Poetry Month displays at four Madison public library locations, and distributed at the Milward Farrell Fine Arts Gallery, Ma Cha Teahouse & Gallery, Absolutely Art, Bungalow Gallery, Java Joint Escape Coffeehouse & Gallery, Zu Zu Cafe & Market, and Avol's Bookstore. in downtown Madison, Wisconsin. The poems were also featured in a literary periodical called A Cup of Poems and a Side of Prose, and on WisconsinPoet.com. Poems related to biking, walking and an appreciation for nature were distributed by two different companies, Community Car and Budget Bicycles, in palm-sized vinyl-covered books tucked inside the glove compartments, and on laminated bookmarks attached to the handle bars.